A temporary bridge collapsed in a construction zone on the 91 Freeway in Corona Friday, Oct. 9, 2015. CORONA, Calif. -- At least nine construction workers were injured after a temporary bridge collapsed in a construction zone on the 91 Freeway in Corona Friday night. 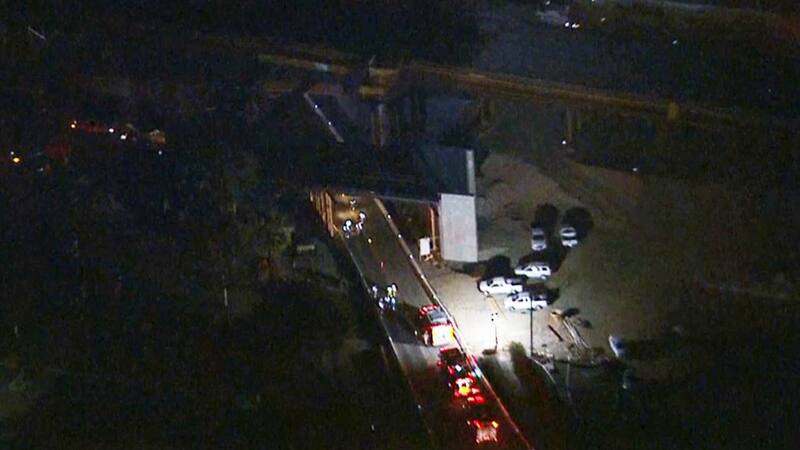 The partial collapse of the East Grand Boulevard undercrossing bridge occurred at Joy and Third streets around 11 p.m., where the victims were working on the 91 Corridor Improvement Project created by the Riverside County Transportation Commission. The workers were lowering an on-ramp bridge into place when the jacking operation failed, causing the bridge deck to drop about 16 inches and hit the wooden support beams. "The support beams hit workers, causing injuries," the commission said in a press release Saturday. All victims, affiliated with the prime contractor Atkinson Walsh Construction Joint Venture, were transported to the nearest hospital. As of Saturday morning, one of the nine injured workers had been released and three workers remained in critical condition. Initially, the commission said 10 workers were hurt, but later lowered the number to nine. The construction project began in 2014 as an initiative to widen the 91 Freeway with one regular lane and two toll lanes in each direction. The 91 Freeway is open, but East Grand Boulevard remains closed to motorists. There was no impact to the 91 Freeway, officials said.